Note: Please note, the afternoon showing is on the 10th only and 15.30. All other shows are at 20.00. Elvis’ Stardust is a short, melancholy rhapsody of tiny gestures, stolen glances, distant rhythms. It is a gesture of love embodied, the breath of a star, of which dust is all that remains of its swift demise. One body takes over another to reveal hidden senses, ambiguities and driftage. 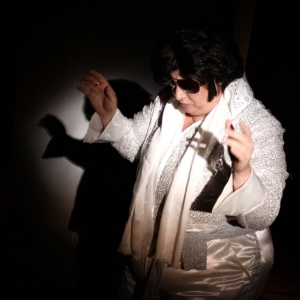 Elvis is the performer, one within the other, flesh within flesh, in a sweet yet mournful embrace. On stage, he is a comical figure out of time and out of context. The world around him has changed, and the giant garbed in dazzling white is a reflection of lost elegance. He stands in improbable places, emerging like a ghost, carving out spaces where he improvises the echoes of actions and poignant songs in an inevitable ritual of communication. 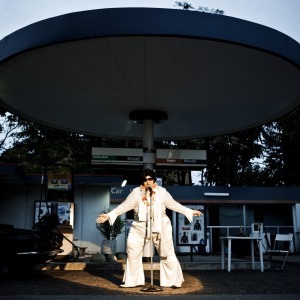 Elvis Stardust will also be at Dance Base this Festival! Check out their website for more information.